Naburn really is a small school with big ideas! We currently have a small number of places available in some year groups and are showing people around for next September. If you would like find out more or if you would like to visit our fantastic school please contact us. You can email naburn.primary@york.gov.uk or ring us on 01904 551075. Will your child start reception in September 2019? You should apply for your child to start primary or infant school in the school year your child turns 4. For entry in the September 2019 school year, children will have been born between 1st September 2014 and 31st August 2015 and the deadline for ‘on time’ applications was the 15th of January; late applications may be made after this date. As a voluntary controlled school, our admissions arrangements are set by City of York Council as the admissions authority for our school. Details of the admissions policies that apply can be found here. For any queries about the admissions policy or process you can email education@york.gov.uk or call 01904 551554. Applications for a place are made through the admissions team at the City of York Council and applications for a place in Reception starting in September 2019 opened on Wednesday 12th September 2018. The deadline for applications was Tuesday 15th January 2019. Late applications can be made after this date, though these may be looked at after other applications. National Offer Day will be Tuesday 16th April 2019. 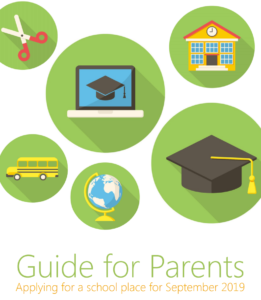 Please read the Guide for Parents when applying for a school place, as it contains key information on school admissions. You can also find the Guide to School Catchment Areas online. We also advise you to keep checking on the City of York Council Admissions site to keep updated with key dates throughout the year. CLICK HERE TO APPLY ONLINE FOR A SCHOOL PLACE IN RECEPTION. If you can’t apply online you can request a paper Primary Application Form by calling 01904 551 554. Forms are also distributed to primary schools and nurseries in the York area.